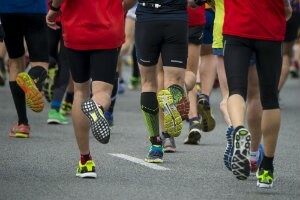 In 1962, Neil Sedaka famously crooned that “breaking up is hard to do.” He probably wasn’t talking about his favorite pair of running or athletic shoes, but for those of us who enjoy active lifestyles, the bond between an athlete and his or her comfiest pair of old sneakers is often very real! However, while breaking up is indeed hard to do, you have to know when it’s time to let go. Yes, a well made pair of shoes can last you several months to a year or longer, depending on how much you use them. But they don’t last forever. With enough mileage, they stop offering you the support and cushioning you need to prevent pain and injury—even if, on the outside, it looks like nothing is wrong. That’s because the midsole—the part of the shoe between your foot and the sole that operates as a shock absorber—compresses and loses its springiness over time. The shoe may feel like it fits you like a glove, but if it can’t cushion the impact shocks anymore, your feet are going to get stressed much faster than in a new pair of shoes. Furthermore, more obvious signs of wear—glue separating, treads fraying, even holes appearing—may become increasingly apparent. Generally speaking, most athletic and running shoes should hold up for around 300-500 miles of running, or about 45-60 hours of strenuous sports play (basketball, tennis, dance, etc.). Yes, that’s a pretty big range, because it depends on a lot of factors, including the quality of the shoe and the stress from each impact. For example, those who are overweight or who run with a very hard, high-impact heel strike will probably wear out their shoes faster, all other things being equal. Every 300-500 miles is a pretty good guide—that’ll tell you if you’re in the right ballpark. If you begin to experience more foot pain or blisters during or after exercise—especially if you haven’t changed your shoes or routine much—you probably need new shoes. You notice the treads on your shoes have worn down considerably, especially if the wear patterns are uneven. If you want to increase the mileage you get out of your athletic shoes, try not to use them for everyday purposes, but only for sports. You can also buy a couple of pairs of the same type of shoe and rotate them so you get to enjoy a comfy, reliable fit for twice as long. For more foot and ankle sports care tips, keep reading the Dallas Podiatry Works blog! If you need help finding a good pair of shoes that fit you well, or you need help with a sore, painful foot or sports-related foot or ankle injury, please call us at 972.566.7474 to set up an appointment. Alternatively, you can fill out our contact form online.